The Propolia Organic Face Mask is the perfect antidote to tired, dull skin. It uses the power of natural ingredients to make skin feel regenerated; it nourishes from the outside in. 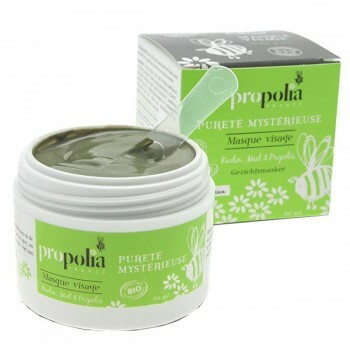 The Propolia Organic Face Mask both moisturizes and purifies, due to its unique mix of ingredients. Honey helps to soften and treats redness and irritation, while propolis calms unhappy skin. It also contains a mix of green illite clay which targets acne and oily skin, while white kaolin clay is ideal for dry and sensitive skins. After using the treatment, skin will look radiant and glowing. Propolia's wider range of beauty products also uses the wonder-ingredient propolis. Aqua (Eau), Kaolin, Illite, Mel (Miel)*, Prunus Amygdalus Dulcis Oil (Huile d'Amande douce)*, Glycerin**, Corylus avellana seed oil (Huile de Noisette)*, Alcohol**, Cera alba (Cire d'Abeilles)*, Propolis cera (Propolis pure)*, Salvia Sclarea Oil (Huile essentielle de Sauge sclarée)*, Lavandula Angustifolia Oil (Huile essentielle de Lavande)*, Cymbopogon martini herb oil (Huile esentielle de Palmarosa)*, Rosmarinus Officinalis Leaf Oil (Huile essentielle de Romarin)*, Citric Acid, Dehydroacetic Acid, Benzyl Alcohol, Geraniol, Linalool.